The Veil of the Temple: The All-Night Vigil was commissioned for the Temple Church in London, and conceived and executed on an unprecedented scale; its performance lasts some hours. 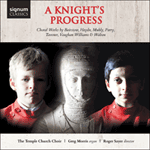 The present version was prepared by the composer and lasts about three hours. In this version the original eight cycles are ‘mirrored’ rather than performed as entities. The gradual ascent throughout the cycles is also ‘mirrored’. It is not liturgy, although it has a liturgical dimension; neither is it concert music. (That is, in the sense of being a work of art designed as an end in itself and meant to express and flatter merely human qualities.) The reasons for art do not lie within art itself, which must always strive to connect with what transcends the human as such. The purpose of The Veil is to awaken, through music, some realisation of what is meant by man’s being created in the Divine Image. The performance of The Veil is a musical journey using voices and instruments. Performance takes place at night in a sacred space, and the object of the journey is to make effective a heightened state of being of the listener through a symbolic unveiling from darkness towards light. The soul’s journey is to move from the existential darkness of temporal duration—time—towards the Glory of the divine instantaneity, the ever-abiding light of the Eternal. It is also, for the symbolic themes are threaded and interwoven throughout the music’s unfolding, at the beginning in the absence of light, a waiting at the tomb of Christ for the Light of the Resurrection. The listener should be aware at the outset of two features of the conception of The Veil which act as important non-auditory aspects of the music’s performance. The first feature might be said to form the seminal idea (archetype) of the whole work. It is the idea that any claim to an exclusive possession of Truth by any sacred tradition is equivalent to placing a limitation of the infinitude of the Divine which must, by definition, encompass everything. Whatever symbols, words or characterisation used to define or express the nature of God and His relationship to man must, in the final analysis, be seen inevitably as an accommodation to man’s earthly state. In order to embrace the infinitude of God, all forms have to be shattered—even that of The Veil. In the religious context of the music this means all models of a manifest Temple of Jerusalem must finally be discarded in the Face of the Divine Presence. The second non-auditory aspect of The Veil’s conception is closely related to the first, and underscores the whole work. God is nothing, in the sense that God is no thing. In the last twenty minutes of the work the awakened soul has moved from darkness to light until a point is reached, with the intensification of the light, that there is a sudden explosion of light. This is the rending of the Veil. Some indication of the depth and complexity of the symbolic resonances at the climax of The Veil can be gauged by recalling the following themes, which, in varying degrees of intensity, are underwritten by the music of the eighth cycle: The Goal of the Journey; Totality of Light; The Light of the Resurrection; The Rending of the Veil of the Temple; Destruction of the old order—the exclusivity of the various differing religions; Destruction of any manifest structure of the Holy Temple of Jerusalem through the realisation of the greater spiritual and metaphysical model of the Temple within; Realisation of Self. Ah! What was there in that candle’s light? and I have been consumed! My soul heard something from your soul. And was borne away in its current. Without form, void, chaos. Word. En archée een o Lógos. you tread the ways of the wind. Outside the gates of Paradise. pray for me, pray for me. What God is, we do not know. He is not light nor spirit, nor one. Our Father, which art in heaven, hallowed be thy name. Thy kingdom come. who is the living coal. Hail, O Mother of God! Hail, fiery throne! Before this ikon of your radiant brightness. Alleeloúia. Theós erastós, Theós agapeetós, Dóxa see. Beloved God, Glory to thee. Let not your heart be troubled: ye believe in God, believe also in me. In my Father’s house are many mansions: if it were not so, I would have told you. I go to prepare a place for you. And if I go and prepare a place for you, I will come again, and receive you unto myself; that where I am, there ye may be also. And whither I go ye know, and the way ye know. Thomas saith unto him, Lord, we know not whither thou goest; and how can we know the way? Jesus saith unto him, I am the way, the truth and the life: no man cometh unto the Father, but by me. If ye had known me, ye should have known my Father also; and from henceforth ye know him, and have seen him. Philip saith unto him, Lord, show us the Father, and it sufficeth us. Jesus saith unto him, Have I been so long time with you, and yet thou hast not known me, Philip? He that hath seen me hath seen the Father; and how sayest thou then, show us the Father? Have mercy on me, O God, in your great mercy: according to the fullness of your compassion, wipe my sins away. Jesus, having risen from the tomb as he foretold, has given us eternal life and his great mercy. In thy kingdom remember us, O Lord, when thou comest in thy kingdom. Blessed the one who always hated evil-doing, that is full of shame, and presented himself as a living sacrifice, well-pleasing to the Lord. Blessed the one who always keeps the memory of God in himself, and he will be wholly like an angel from heaven upon the earth, ministering to the Lord with fear and love. Blessed the one who loves repentance, that saves sinners, and has not thought of doing ill, like someone ungrateful before God our Saviour. Blessed the one who, seated in his cell, like a noble warrior guards the treasures of the kingdom, that is his body with his soul, blameless in the Lord. Blessed the one who, seated in his cell, like the angels in heaven keeps his thoughts pure, and with his mouth sings praise to the one who has authority over every thing that breathes. Blessed the one who has become like the Seraphim or the Cherubim and never wearies in his spiritual ministry, unceasingly giving glory to the Lord. Blessed the one who is always full of spiritual joy, and has not grown slack in bearing the Lord’s good yoke, for he will be crowned with glory. Blessed the one who has cleansed himself of every stain of sin, so that with boldness he may receive into his own house the King of Glory, our Lord Jesus Christ. You mantle yourself in light, stretch out the skies as a curtain; the clouds your chariot, you tread the ways of the wind, making winds your messengers, flaming fire your servant, on a firm base establishing the earth, which forever will not be moved. Outside the gates of Paradise, I sat and wept. O Blessed Paradise, pray for me, pray for me. With the rustling of your leaves. What God is, we do not know. He is not light nor spirit, nor one; nor what we name as God-head; not wisdom, not reason, not love, not will nor grace. You mantle yourself in light, stretch out the skies as a curtain; the clouds your chariot, you tread the ways of the wind, making winds your messengers, flaming fire your servant, on a firm base establishing the earth, which forever will not be moved: the deeps enrobed it; the waters stood above the mountains. At your rebuke they flee, at the voice of your thunder they rush away. Mountains rose, valleys sank down to the place you established for them. You filled the bounds they may not pass, nor return to cover the earth. Our Father, which art in heaven, Hallowed be thy name. Thy kingdom come, Thy will be done on earth, as it is in heaven. Give us this day our daily bread; And forgive us our trespasses, As we forgive those who trespass against us. What God is, we do not know. He is not light nor spirit, nor one; nor what we name as God-head; not wisdom, not reason, not love, not will nor grace; no thing, no unthing, nothing. What He is—I and you and no created thing ere we came to be. Alleeloúia. Theós erastós, Theós agapeetós, Dóxa see o Theós. Absolved; in the mirror, you see the Trinity, its eternity and glory, and exult in it. What God is, we do not know. He is not light nor spirit, nor one; nor what we name as God-head; not wisdom, not reason, not love, not will nor grace; no thing, no unthing, nothing. What He is—I and you and no created thing ere we came to be, never encountered what He is. O Mary Theotokos, thou art the mystic tongs, who conceived in thy pure womb Christ, who is the living coal. Hail, O Mother of God! Hail, fiery throne! Hail, candlestick that bears the Light! Hail, mountain of sanctification! Hail, ark of life! Hail, temple never to be destroyed! Hail, veil of the temple! In thee rejoiceth, O thou who art full of grace. O thou Mary, full of glory, glory to thee. Awed by the beauty of thy virginity, and the exceeding radiance of thy purity, Gabriel called out unto thee, O Mary full of grace. Mother of God, here I stand now praying, before this ikon of your radiant brightness; not praying to be saved from a battlefield, not giving thanks, nor seeking forgiveness for the sins of my soul, nor for all the souls numb, joyless and desolate on earth,—but for her alone, whom I wholly give you. Alleluia. Tavener was heavily influenced by the ragas of Indian music and their attendant philosophy, and with this in mind it occurred to me in the middle of the recording sessions that, while the orchestra plays the hypnotic chords of Mother of God, Soumik Datta could embellish them with an improvised sarod solo. 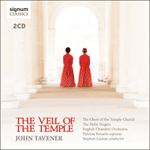 Mother of God is part of the seven-hour epic, The Veil of the Temple, a work Tavener considered to be his supreme achievement. 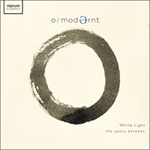 He called it his musical attempt to pierce through the ‘wall of illusion’ and share the message that, behind the veil, all is one: ‘all religions are in their transcendent way inwardly united beneath their outward form.’ In this recording, the work is prefaced by overtone singing, the physical embodiment of white light (the fundamental tone) being refracted through a prism (the singer’s throat). These words spake Jesus, and lifted up his eyes to heaven, and said, Father, the hour is come; glorify thy Son, that thy Son may also glorify thee: as thou hast given him power over all flesh, that he should give eternal life to as many as thou hast given him. And this is life eternal, that they might know thee, the only true God, and Jesus Christ, whom thou hast sent. I have glorified thee on earth: I have finished the work which thou gavest me to do. And now, O Father, glorify thou me with thine own self with the glory which I had with thee before the world was. I have manifested thy name unto the men which thou gavest me out of the world: thine they were, and thou gavest them me; and they have kept thy word. Now they have known that all things whatsoever thou hast given me are of thee. For I have given unto them the words which thou gavest me; and they have received them, and have known surely that I came out from thee, and they have believed that thou didst send me. I pray for them: I pray not for the world, but for them which thou hast given me; for they are thine. And all mine are thine, and thine are mine; and I am glorified in them. And now I am no more in the world, but these are in the world, and I come to thee. Holy Father, keep through thine own name those whom thou hast given me, that they may be one, as we are. While I was with them in the world, I kept them in thy name; those that thou gavest me I have kept, and none of them is lost, but the son of perdition: that the scripture might be fulfilled. And now come I to thee; and these things I speak in the world that they might have my joy fulfilled in themselves. I have given them thy word, and the world hath hated them because they are not of the world, even as I am not of the world. I pray not that thou shouldest take them out of the world, but that thou shouldest keep them from the evil. They are not of the world, even as I am not of the world. Sanctify them through thy truth: thy word is truth. As thou hast sent me into the world, even so have I also sent them into the world. And for their sakes I sanctify myself, that they also might be sanctified through the truth. Neither pray I for these alone, but for them also which shall believe on me through their word: That they all may be one; as thou, Father, art in me, and I in thee, that they also may be in us: that the world may believe that thou hast sent me. And the glory which thou gavest me I have given them; that they may be one, even as we are one: I in them, and thou in me, that they may be made perfect in one; and that the world may know that thou hast sent me, and hast loved them, as thou hast loved me. Father, I will that they also, whom thou hast given me, be with me where I am; that they may behold my glory, which thou hast given me; for thou lovedst me before the foundation of the world. O righteous Father, the world hath not known thee, but I have known thee, and these have known that thou hast sent me. And I have declared unto them thy name, and will declare it: that the love wherewith thou hast loved me, may be in them, and I in them. When Jesus had spoken these words, he went forth with his disciples over the brook Cedron, where was a garden, into the which he entered, and his disciples. What shall we say then? Shall we continue in sin that grace may abound? God forbid. How shall we, that are dead to sin, live any longer therein? Know ye not, that so many of us as were baptized into Jesus Christ were baptized into his death? Therefore we are buried with him by baptism into his death: That like as Christ was raised up from the dead by the glory of the Father, even so we should walk in newness of life. For if we have been planted together in the likeness of his death, we shall also be in the likeness of his resurrection: knowing this, that our old self is crucified with him, that the body of sin might be destroyed, that henceforth we should not serve sin. For he that is dead is freed from sin. Now if we be dead with Christ, we believe that we shall also live with him: knowing that Christ being raised from the dead, dieth no more; death hath no more dominion over him. For in that he died, he died unto sin once: but in that he liveth, he liveth unto God. Awake thou that sleepest, and arise from the dead, and Christ shall give thee light. Ton éelion kréepsanda tas idhéeas aktéenas, ke to katapétasma tou naoú dhiaragén. The sun hid its rays and the Veil of the Temple was rent. Who will defend the Holy Temple? Who will deliver the Tomb of Christ? No one, no one, no one, the Temple is destroyed. Night. Night from my most sweet brother has estranged me, cutting Love’s uncut Light. No, no, no, the Temple is not destroyed forever. The light of Christ shines on all. The Light of Christ shines everywhere. As many of you who were baptised into Christ, and have put on Christ, Alleeloúia. O God of God, make the litany of light arise, make the people of the light arise, guide the light towards the light. Amen. Come, receive the Light of Christ. And I saw no Temple therein, for the Lord God Almighty and the Lamb are the Temple of it. Surely I come quickly. Amen. Even so, come Lord Jesus. Sink this universe in God. And everything that lives on earth! THAT ONE is resting, and yet restless, And far yet near! THAT ONE is inside all, and still outside all. Sink this universe in God. Púrnam adah, púrnam idam, púrnat púrnam udacyate, purnasya púrnam ádáya púrnam evavashishiate. Aum. Shántih, shántih, shántih. That is full, this is full. The full proceeds from the full. Taking the full from the full, the full remains. Aum. Peace, peace, peace. Shine, shine, O new Jerusalem, for the glory of the Lord hath arisen upon thee.